Jean Bouret, L’Ecole de Barbizon et le paysage français au XIXe siècle, Neuchâtel, Ides et Calendes, 1972, p. 13. Gérald Schurr ; Pierre Cabanne, Dictionnaire des Petits Maîtres de la peinture, 1820-1920, Paris, Les Editions de l’Amateur, 2008, p. 179. Up to the very early years of the 19th century, landscape art was not officially recognised by the Salon’s authorities, and solely picturing a landscape remained unthinkable. However, more and more artists, encouraged by the invention of the tube of paints, investigated the idea of painting oil sketches directly from nature, either on paper or on small canvas. It gave one of the most creative and fascinating periods in the genre of landscape, in Europe. Some of these painters organized themselves in a movement, now called the School of Barbizon, that would make the forest of Fontainebleau and its surroundings their main experimenting grounds. Eugène Cicéri was one of them. First trained in the decorative art by his renowned father, the painter Pierre Luc Charles Cicéri, Eugène quickly switched to landscapes, thanks to his uncle, the painter Eugène Isabey, with whom he shared an apartment in Pigalle. It is in this neighbourhood, inhabited by painters like Théodore Rousseau or Jean-François Millet, that he met the Barbizon’s founding members. Adhering to this school, Cicéri depicted in his landscapes a peaceful rural France, far away from industrialisation. 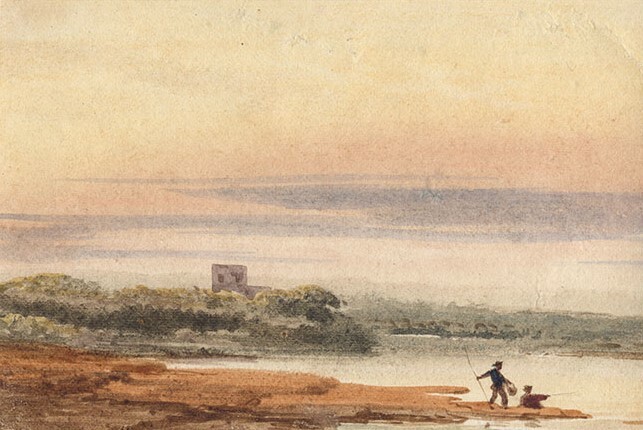 These present works are of his debuts, when he was concentrating on Paris’ surroundings and on Normandy, but already displayed the particularities which would be his: small-sized watercolours with a penchant for shimmering skies, a characteristic inherited from Eugène Isabey who also suggested him the taste for colours . If the landscape dominates, the human figure is often present, undoubtedly to remind us of the link that binds mankind and nature. His participation to the 1851 Salon, which saw the first exhibition of works from realist painters and members of Barbizon, crowned the artist as a fulfilled landscape painter.